1.) Discuss Your Dive Plan. It’s happened to all of us…you get so excited to jump in the water and forget to discuss your dive plan with your buddy. Next thing you know, both people are heading in different directions and you spend more time communicating with hand signals underwater than exploring the site. It’s best to discuss the dive plan with your buddy after learning about the dive site, and just before your dive. Chat it out while gearing up, or immediately before gearing up if you are not a good multi-tasker. By discussing your dive plan together, you make sure to structure the plan so that you both have time to visit all the spots you are interested in while keeping your dives within a safe profile. It also gives you time to teach your buddy what your newly invented hand signals represent. 2.) Gear Up Together. Ever remember a time when you have looked around for your buddy to help you secure those hard to reach fins or maybe help retrieve another O-ring to realize they are already geared up and are in the water? Not only will gearing up together be helpful for those last minute gear issues like forgotten weights, properly securing a misplaced Octo hose, etc…but it also gives time to make sure you both are safe by performing your PADI-Begin With Review And Friend buddy check (BCD, Weights, Releases, Air and Final Check). This helps eliminate gear issues underwater and gives you more time to safely enjoy the dives. 3.) Communicate Frequently Underwater. There are some really neat ways to communicate underwater. Today you can purchase underwater communication gear with microphones and headsets, or stick with the basics of tank bangers, inflator hose whistles, maracas, tablets and the good old tried and true hand signals. Communicating frequently helps to make sure you are at a proper distance away from your buddy, but more importantly it allows you both to check-in in with each other while underwater. Communicate such things as the amount of air left in both buddies’ tanks, is your buddy doing ok?, and of course alert them to cool critters! 4.) Gear Down Together. The best time to share in the excitement of what you may have seen underwater occurs following your dive(s) in the moments surrounding gear break down. Similar to item #2 (Gear Up Together), it’s nice to have another set of hands to help with those hard to reach snaps and straps. When coming out of the water, I personally appreciate a helpful buddy on deck to grab my fins as I lug the rest of myself and scuba gear out of the abyss (during a boat dive). Help each other to keep the space around you free of clutter, which can be a huge slip and trip hazard. 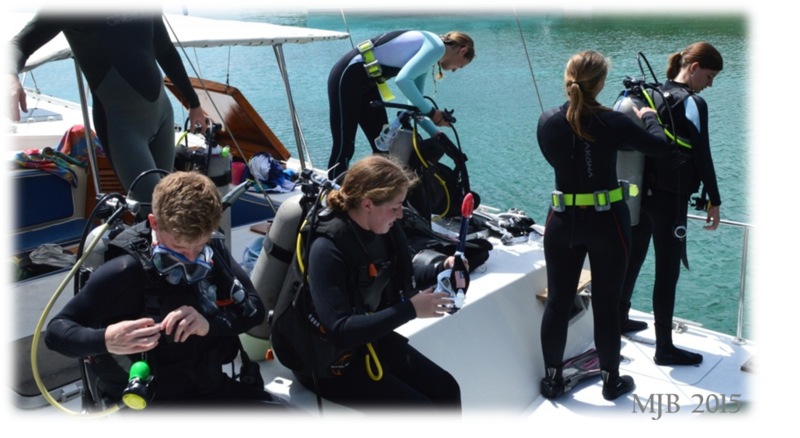 Assist one another by rinsing gear and either staging your gear for the next dive or properly stowing it away. 5.) Record Your Dives. I have heard it countless times from very experienced divers…”I wish I would have been better at logging my dives.” A good buddy will remind you to log your dives, while it’s fresh in your mind. Not only do you need proof of logged dives to advance your certifications, but it’s also great to record all of those cool critters and experiences. I’ve gone back through my dive logs to read about some past dives I did years ago, and was reminded of those priceless moments underwater with some epic details I may have forgotten had I not written it down. It’s also good to record any gear, buoyancy, or other issues you may have had above or below the water in order to prevent it from happening in the future. Another helpful trick is to record the type of gear and amount of weights you used in order to make gearing up quicker next time. It’s worth the extra 10 minutes after you dive to write it all down…I assure you! So be a good dive buddy by discussing your dive plan, gearing up together, communicating frequently underwater, gearing down together and recording your dives. You and your buddy will appreciate diving even more together. Cheers to diving safely, with a great dive buddy!